The following text is a broad sketch of the present-day situation in Syria. The major powers at hand fighting for control over the Syrian territory are going to be presented, along with estimations on the balance of powers in the battle theaters. The information derives by distillation over numerous media reports, by taking out the propaganda elements and getting into the core of the subject, as much as possible. The Syrian crisis is of outmost importance also for the issue of "Radical Islamism in Southeastern Europe" since the major forces of the opposition in that particular country are composed by radical (Sunni) elements and are also in contact with similar groups in the Balkans and Turkey. -Alaawites, Shia and Christians back him up by around 90% whilst Sunnis and Druses are split evenly between him and the opposition. -Qatar-Gulf States, Saudi Arabia are fully backing the opposition and Turkey is being used as a stage point for men and ammunition towards Syria. - UK- and France especially are against Assad's government but have lowered down tones over the past 4 weeks. - USA is favoring the opposition but hesitates to intervene, judging other global interests as more pressing, whilst it is estimated that the new State Secretary Kerry, will seek a bargain with Russia to end the crisis. - Israel fluctuate its stance and has been generally been neutral, since Tel-Aviv fears destabilization in the region and the takeover of both Syria and Lebanon by Sunni extremists. - Jordan is also worried by the Muslim Brotherhood advance (which is supported by Qatar) because the royal family of Jordan has been in opposition with them for quite some time. 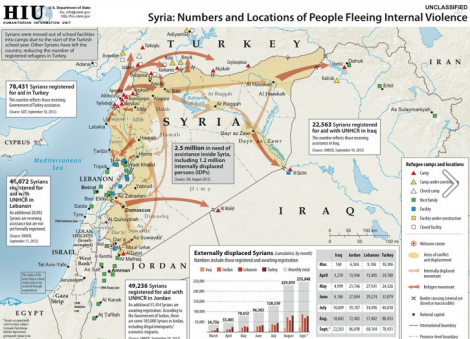 Also a further influx of Syrian refugees will create major societal problems. - Iraq is also used as a traverse point for sending weapons and men from Iran to Syria and also keeps a rather neutral stance. -China supports Assad, mainly through providing communication systems, capital and diplomatic support. Around 20 Albanians from Kosovo are fighting in Syria as mercenaries. One has been killed already and another is injured. It is also estimate that Sunni Muslims from Bosnia have also joined rebel forces. They all travel there by first entering Turkey through Istanbul and then are driven towards the Turkish-Syrian borders. Further, the Turkish foreign policy as a whole has been actively supporting the opposition as a part of its "grand strategy" of Neo-Ottomanism, hoping it will assist Ankara's plans into getting in the Middle East as a major power for the first time since the beginning of the 20th Century. 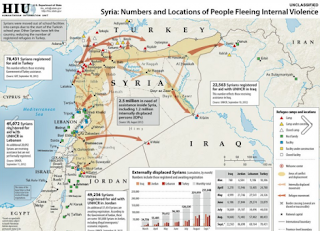 In early 2012 a reverse route of Syrian rebels to the Western Balkans was also noted by international authorities. -Most Balkan countries support the opposition, but with reluctance. -Arms contraband routes for both the Syrian government and the opposition have been noted to exist from Western Balkan states to Syria via Mediterranean Sea routes and also from the Black Sea. -Sunni groups that are influenced by Turkey, Saudi Arabia or Qatar, have mobilized politically in the Balkan countries for support for the rebels. The Kurds play a significant role in the whole balance of powers. For the moment they have established a sort of autonomous region, but detest the rule of the Sunnis, so they are actually used as a buffer zone in advantage of Assad. Numerous attempts to establish a wider autonomous zone between Syrian Kurds, Iraqi ones and the PKK in Turkey have been unsuccessful but constitute a dramatic change of the regional balance since they endanger the sovereignty of Turkey at any given moment. All available information point out that the Kurdish element will play a decisive role in the culminations. Assad easily breaks the embargo posed to him by supplying with necessary commodities through Lebanon and the port of Beirut and through Iraq but also through the Bedouin merchants that are scattered across the Syrian Desert which stretches from Syria to Iraq and Jordan up to the Red Sea. Trade is also conducted with Turkey itself and Iraq through Kurdish intermediates. It is rather easy for Damascus to find weapons and other commodities, as long as there is money and gold available or the ability of barter trade with the tribesmen. Moreover Syria until the beginning of the civil war was a country quite sufficient in food stocks, fuel and medicine and the state apparatus still functions on a rather good mode in most parts of the country. The effects of the embargo against Syria have achieved little in terms of the capability of the Syrian state to sustain itself. The perpetuation of the civil war in Syria between all the different minorities seems like the most probable option, since the country is actually an artificial state. Before 1945 it was a French colony (and before that an Ottoman region) where no single ethnic-political unit held a unitary state power. Should the Baath party falls the outcome it will be similar to Yugoslavia, but in a much bloodier fashion. The possibility that crisis will eventually spread to Lebanon is high due to the interdependence and ethnic similarity between the two countries. Moreover the Kurdish factor will probably spread the crisis into Turkey itself and Iraq. Bigger refugee waves across the Middle East should be expected and a turmoil in respect of global energy prices. In addition the existence of chemical and biological weapons is another important factor to be assessed that eventually will lead to international intervention with unknown consequences. The existence of mercenaries from all over the world in Syria, poses yet another security issue for all countries in the region that may have to deal with the activity of those when the conflict is over. Damascus is the capital and the political nerve center: For the moment controlled by Assad around 80%, although every 4-6 weeks for the past year the rebels try to infiltrate the center, with no success so far. Aleppo: It is the economic center of the country, now is being controlled around 70% by Assad, and fierce battles rage in the suburbs. Along with Damascus, it is a city that if it falls in the hands of the rebels it will signify the end of Assad. Latakia: Same as above. It is speculated that this will be the destination of Assad, if Damascus falls. Eastern desert territories: Evenly split between the state and the rebels. There are lots of contradicting reports about the actual state of affairs. The region is scarcely populated, a lot of massacres are happening there by either side. Turkish-Syrian borders: Mostly in control by Kurds, a lot of inroads by rebels and sporadic attacks by Assad's helicopters. It is becoming a no-man’s land. Golan Heights nearby region: Until recently the rebels had a stronghold there, but since November it was sealed off by the state army. Borders with Lebanon: Sporadic fights are happening between Assad’s forces and Mujahedeen coming from Lebanese camps. Most of the border line is controlled during the day, but during night men and ammunition find paths to enter Syria. Damascus and Aleppo are the main urban centers of gravity for the whole of the country. If the rebels are not able to fully control them, then they won’t have chances of toppling the government. Thus, they remain as the main target of their operations. On the other hand Assad's forces aim to seal-off the borders with Lebanon, so as, to keep substantial manpower and fighting capabilities to control the vital urban center axis of Aleppo - Idlib -Hama-Homs-Damascus and in essence have power over the majority of the population and the country's GDP, whilst leaving open space to the rebels in the Syrian desert and close to the Turkish borders where they will also have to compete with the local Kurdish community. As the Syrian crisis enters the 2nd year, it is high time for the United Nations and the major powers that have influence in the Security Council, to draft a peace process aiming to keep the integrity of the Syrian state before the tribalization process mutates across the region. The strategic aim of Assad to crack the opposition has failed, so has the rebel strategy of toppling him from power. Therefore a mean solution needs to be found; otherwise the whole of the Middle East could go from an "Arab Spring" to an "Afghan winter".